You know how you've always wished for an alien-slime powered clock? Well, your wishing is over! 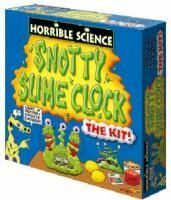 Horrible Science now brings you the Snotty Slime Clock kit, full of different kinds of clock technology - the slimy, snotty clock, an amazing water cloth, and a no-carbon-emissions, completely green sundial clock - although the slime clock is the coolest.